I’m going to be posting my favorite episodes of various shows. Emphasis on favorites, not necessarily the best crafted or best written, just the one’s I like watching best. So these are 10 of my favorite episodes (or serials, a few are two parters) of Doctor Who. I had to bump a few really impactful episodes, but these are ultimately the crown jewels of Doctor Who in my mind. From 2005 to 2012. The title says it all. This is really an episode that was tailor made for me, personally. I can understand why other people my not like it, but I spent the majority of the evening squealing at my television screen. I dropped “The Angels Take Manhattan” (which was excellent and made me explode in a pile of tears every other scene) for this episode, but as someone who loves dinosaurs to the point of considering a career in paleontology and lives in a mind-palace of space and time travel, it combined all the finer things in life. 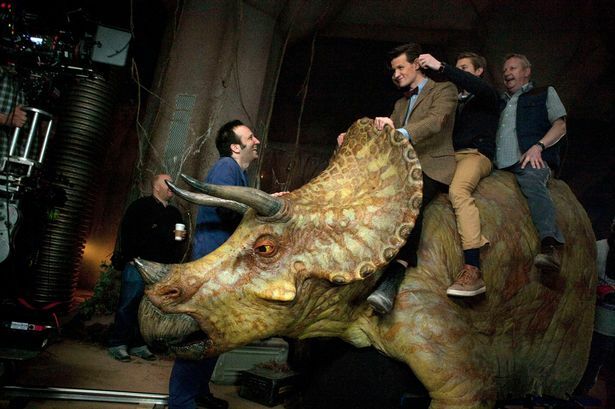 My favorite dinosaurs when I was young were Triceratops and I loved that a triceratops aided the Doctor and co. throughout the episode. If I didn’t go into paleontology then I wanted to go into Egyptology (though I ended up studying film, of course) and just to make it even better, Queen Nefertiti plays a large part in the episode. Two different Harry Potter alumni showed up, both in major roles and there were enough Jurassic Park tie-ins to make any nerd giggle with glee. It’s not a great Amy episode, but it’s brilliant for Rory, whose dad, Mr. Weasley…er…Mark Williams, makes his first appearance. And Rory’s wife’s a redhead. Good stuff. It’s the conclusion (until season 4) of the greatest love story in all of Doctor Who, though I loved Sarah Jane’s relationship with the Doctor in Classic Who. In addition to that, there is a a glorious shouting match between the Daleks and the Cybermen, the Doctor strolls around Torchwood headquarters, wearing 3-D glasses, and by the end you will literally be screaming at the TV. Sometimes it’s good to be sad…or something…and these episodes are heartbreaking. 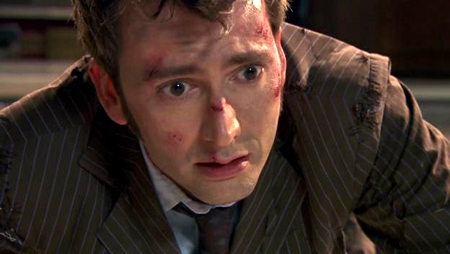 The moment when Rose finally says that she loves the Doctor and the Doctor fades away right before her eyes, as he’s about to return the sentiment, is probably still the most heart-wrenching moment of the show. And while Rose isn’t my favorite companion (that’s an honor reserved for Donna) she’s my favorite love interest of the series. It was bad enough that Rose would have been separated from her mother, father, and Mickey, but that she loses the Doctor instead, is far worse. 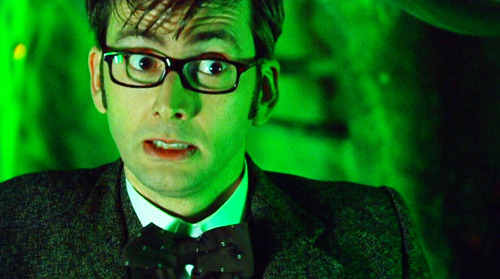 My mother has not seen the show, but she happened to be wandering around the room while “Doomsday” was on and she got so caught up with the story and the characters that at the end she was screaming “say it!” at the Doctor right up until he disappeared at which point she started saying “what?! Woah, they didn’t let him say it.” And I think that was most people’s reactions. Rose was many people’s first companion (that includes me) and “Army of Ghosts/Doomsday” gave her a beautiful send off, though it tore us, as the audience, apart. Speaking of heartbreaking….The Doctor loved Rose, but even while he was traveling with her he found other little romances along the way, including Madame de Pompadour, played by Sophia Myles, who at the time, was the real life girlfriend of then Doctor, David Tennant. The passion between the two definitely came across on screen (we get to see the Doctor full on make out with someone, and it’s pretty great). And the bad guys are actually pretty creepy, I’m still afraid of broken clocks, and they add a steampunk element that I’d like to see a bit more of in Doctor Who. 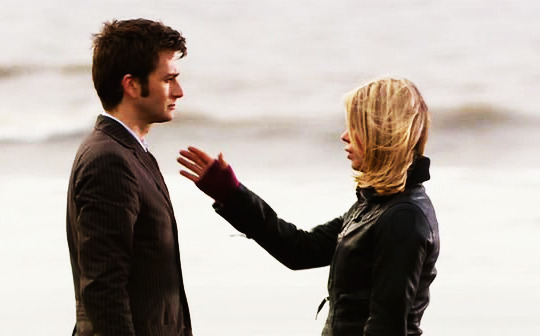 It’s also interesting to watch how Rose copes with the Doctor’s sudden romantic interest in someone other than her. The episode immediately proceeding this is “School Reunion,” in which Rose discovers that the Doctor has had many previous companions and had a similar relationship with some of them. While she acts less than gracefully when she meets Sarah Jane, Rose is further out of her element with this historical figure that the Doctor finds exciting and refreshing. Despite this Madame de Pompadour is incredibly likable and you think maybe, just maybe, there’s a way to work everything out, so no one will get hurt. 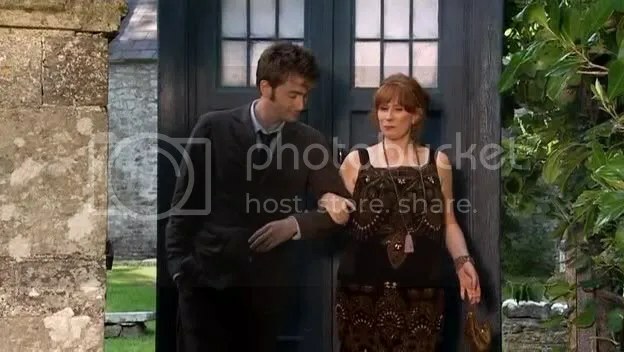 This, of course, is not the show’s style and when the Doctor returns to take her traveling, he’s gotten the timing wrong, as he so often does, and she’s already passed away. There’s also some beautiful and clever dialogue in this one. Yes, it’s the third episode from the second season in a row. What can I say? It’s a great season. When you think about it any TV episode about TV should interest the person watching it. The catch about this one is watching TV can steal your face. That means exactly what it sounds like. You won’t have a face anymore. You still have your head it’s just smooth in front. This creates a canundrum as the episode is so good you want to watch 10 more right after it, but you’re a little worried the screen will eat your face. A lot of the fun of this episode comes from the time period it’s set it. It’s the 50’s and the Doctor and Rose, thinking they’re on their way to an American television studio, and are dressed brilliantly, Rose in a poodle style skirt, the Doctor in greased back hair, riding a scooter. Ugh, I had to bump the season 4 two parter “Silence in the Library/Forest of the Dead” (another favorite) for this one. Is it worth it? Where do I even begin? The scarecrows, the little girl, the mirror thing (still terrifies me), the fire and ice and rage speech? It’s creepy, it’s funny, it’s tearjerking, it’s past meets future science fiction. Jessica Hynes, who I will always adore after Spaced, gets to play the love interest (sorry, Martha. He just doesn’t like you that way). The Doctor isn’t really in this episode. He turns himself human to escape from a family of bad news aliens, who have been chasing him through time and space. It’s frustrating, watching what Martha has to go through, cause she really has a tough time of it, but she also shows hints of the soldier that she will become later on. The writing in these episodes is fantastic and give us a glimpse into who, deep down, at least a small bit of the Doctor probably wants to be, romantic, flawed, and loved. In the end, though, he decides he better save the world again, though the moment you realize he’s back is a real triumph (I’ve spent a fair amound ot time opening and closing my pocket-watch, hoping to find out I’m actually a Timelord…no such luck…yet). But there may have been some real love for Hynes’ character as he visits one of her descendants in a later episode just to ask if she was happy (she was). 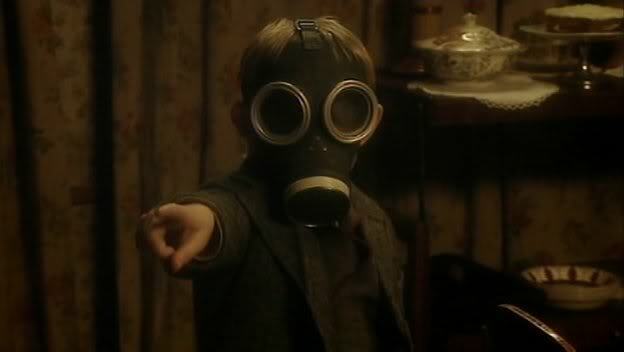 “Are you my mummy?” Maybe it just doesn’t take much to scare me, but the kid in the gas mask kept me from sleeping too terribly soundly the night I saw it. And that scene when they realize the recording has ended and you can still hear the little boy…I’ll be honest, I was a little traumatized. These are really fantastic episodes though. I thought Christopher Eccleston was wonderful as the Doctor and I needed to get him on this list somehow. I found this serial to be the icing on the first season cake. I think they finally met their potential here. I was enjoying the show, but when I got to these episodes I felt like it went to a whole different level and had finally fully realized what it could become. We meet Captain Jack for the first time, a great character with a great introduction. The usefulness of a sonic screwdriver is called into question with hilarious results. And it has a 100% happy ending. Everybody lives, families are reunited, and Rose finally convinces the Doctor to dance with her. 40’s music and swing dancing ensues. The Master’s back! I like John Simm’s portrayal of the Master. Actually my very favorite scene in Doctor Who is when he sings “I Can’t Decide” in the “Utopia” serial and I just couldn’t fit those episodes in. And I’d like it if we could get another episode or two with him, though I doubt it’ll happen. It was just everything. Evil Time Lords, President Obama, a final farewell to all the companions, the death of the tenth Doctor, and our first (very brief) glimpse of the eleventh Doctor. I was upset when they killed off the ninth Doctor. When they killed ten I went a bit hysterical. I still miss him. But aside from that, I really love Wilf’s character and was glad he got to be the companion for a couple of episodes. He deserved it. Especially after what they did to Donna. That was just messed up. I adore the scene at the end where the Doctor has to choose between killing the Master and killing…that other dude…Rassilon? I think it’s supposed to be Rassilon, and he can’t bring himself to kill either, but he breaks the psychic connection anyway, and a the last minute the Master sacrifices himself to save the Doctor. And for a moment you think, the Master did the knocking, which was how the Doctor was supposed to die, but he’s still alive, so maybe, DAMMIT WILF! It was you?! That will make absolutely no sense if you haven’t seen the episodes, but then why would you be reading this? I picked this over “Vincent and the Doctor.” I found I was very annoyed at how often season 6 got me chocked up. Though it was mostly Amy/Rory related. This one was about the Doctor and the TARDIS. The reason I like this episode is pretty straight forward. I just like Idris. She’s one of my favorite characters and she’s only in the one episode (even Canton, another favorite, is in a two episode serial). Her relationship with the Doctor is perfect. Her way of understanding and expressing things is different from any other character on the show. And it took me a second to get into the story, because it’s pretty out there (thank you very much, Mr. Gaiman). The soul of the TARDIS gets extracted from the phone box and possesses a dead girl’s body? Of course once I got past that, I couldn’t get over how awesome the character was. I also like the maze that House traps Amy and Rory in, using the now soulless TARDIS shell. It’s a really funny episode, but has some great badass Doctor lines, and will bring you to the brink of tears at the end. Yes, well, sorry to be so obvious, but, of course this was going to end up on the list. The best Doctor Who villains are introduced in this episode. The Doctor isn’t in it much, separated from the TARDIS, instead we follow Sally Sparrow (as played by the excellent Carey Mulligan), as she unravels the mystery of the Weeping Angels. 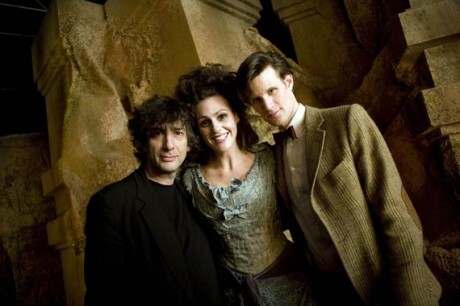 I think this would be a fun episode to watch if you weren’t sure if the Doctor was a good guy in the beginning. I think it would add a whole other element of excitement if you didn’t know he could be trusted. But aside from that, they way they send messages to each other, the jumbled order of things, the way the Doctor tricks the Angels, is all brilliant. And all the characters are great. I showed a friend of mine just this episode of the show and she couldn’t believe that Sally never appeared in another episode, but all the supporting characters, Kathy, Billy, Larry, even Ben, Kathy’s eventual husband, are all extremely likable. I found myself getting attached to them very quickly (unfortunately). It’s just one of those episodes when everyone involved did everything right and the result was bloody smashing. Yeah, yeah. Boo and hiss all you want. It’s still my favorite. It’s just a big (blatant) game of clue and I bloody love it. And shame on me for not having another Donna (who’s at the top of her game here) episode on the list before now (End of Time doesn’t really count). I even admit that the wasp thing is kind of stupid, okay?! I admit it. I should also probably explain that a few years ago I had an obsession with the 1920’s, that never went away completely. I want to go to that party. And how can you not love the kitchen scene? I wasn’t all that familiar with Agatha Christie before this episode, just the basics, she wrote mystery novels, but I was rooting for her before long. Good writing (if a bit of a dodgy storyline at times), good directing, good acting, set, costumes. I’m gushing, I know, but I really do like it as well as all that. And it’s just a madcap story in what turns out to be a pretty heavy season. It’s the one off episode to have fun with. That’s why I like the show in the first place. It’s just a good bit of fun. More than a bit. This entry was posted in tv and tagged 10, 11, 9, amy, army of ghosts, blink, david tennant, Dcotor who, dinosaurs on a spaceship, doctor dances, doctor's wife, donna, doomsday, empty child, end of time, Family of Blood, girl in the fireplace, human nature, idiot's lantern, martha, matt smith, rory, rose, tardis, the doctor, unicorn and the wasp. Bookmark the permalink.